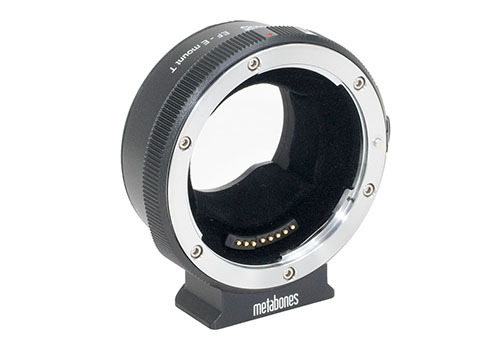 The mount adapter “MB_EF-EBT 5” for the new METABONES “EF lens – E mount camera” was announced. METABONES (Metabornz) ‘s Japan Agency Jue Ltd. will release the Canon EF adapter “MB_EF – E – BT 5” with electronic contact for Sony E mounting in Japan. Release is June 17, 2017. The price is scheduled for 60,185 yen (tax excluded). “MB_EF-E-BT5” is an adapter that can mount the Canon EF lens on the Sony E mount camera. Based on the feedback from the old model Version 4 “MB – E – E – BT 4”, various functions were added and reviewed from the design. Custom function buttons that can newly allocate more than 50 functions, rubber gasket protection to prevent dust and moisture from penetrating the sensor, protect the sensor, LED indicator to notify the operation of the adapter, in-lens image stabilization mechanism and in-body image stabilization mechanism It has a changeover switch to control. It corresponds to autofocus, EXIF information, camera shake correction etc etc by electronic contact as before. Flock coating employing felt material reduces reflection of light entering the adapter and reduces flare. This entry was posted in 3rd Party Lens, Accessories. Bookmark the permalink. Trackbacks are closed, but you can post a comment.